For many of us Thoresby Hall is a hotel complex and despite knowing where it is we wouldn't really consider it as somewhere to go for dinner. Mum has had a few trips up to use their amazing spa previously. Up to now we hadn't even considered their Blue Grill and it's open to non-residents wishing to sample their double AA Rosette award winning restaurants cuisine. We had a very memorable evening and really it shouldn't remain a fine dining secret. Once we'd been escorted down from reception we were blown away of the grandeur and decadence of Thoresby Hall. The Blue Grill has been artfully decorated in blue silk damask and as it's November the hotel is putting on it's Christmas breaks so the room was tastefully decorated to celebrate the season. The room was amazing and really gave an impression of grandeur which we felt would be great for a romantic evening out or even for an intimate wedding reception although there is an adults only policy at the hotel. We're told the room has fantastic views out over the grounds of Thoresby Hall whic is in the heart of Sherwood Forest however as it's a November evening those views fell into the darkness. It certainly would have been nice to see out on a beautiful summers day however we're here as foodies so that's always going to be our priority. We were escorted to our table and to be served by Conor for the evening who seemed a really nice young man. Very knowledgeable about the choices on the menu and happy to see to our needs. He even managed to snag one of the last non-alcoholic cocktails for Jem as it was her night at the wheel. The Blue Grill prides itself on using the best possible ingredients. They have a wide choice of locally sourced produce as well as premium steaks that are USADA Certified and prized Wagyu steaks. Upon ordering out came a couple of very nice fresh bread rolls for us to try. Nice and warm as though fresh out the oven. For our starters at the Blue Grill we opted for the Crab Tian & Salmon Gravlax and the Roasted Pigeon Breast with Roasted Beetroot and Crispy Bacon. We weren't quite sure what to expect after our surroundings had blown us away but we knew it would be something pretty special and weren't disappointed. The Roasted Pigeon Breast came out looking like a piece of artwork. With succulent pigeon breast pieces served with a subtly sweet beetroot puree bringing out the richness of the bird. The bacon was crisped to perfection and added a lovely salty element alongside the roasted beetroot's subtle sweetness. The Crab Tian and Salmon Gravlax came out looking equally as impressive. I have to admit to not knowing what a Tian is when I ordered. A quick google search at the time showed to expect a cylindrical mass however it's always going to be the chef's interpretation of the dish and what came out was a lovely gentle tower of fine crab layered with onion and a fine rice. The crab tian worked well with the soft, succulent Gravlax and Buckwheat Blini with the Saffron Mayonnaise adding additional moisture to the palate. The mayonnaise was so good I'd love to try it in a big portion with chips. Our choice of starter had been a challenge in itself. We'd toyed over the Posh Lobster Finger with crushed peas and mustard leaf, I'd have probably option for the seared scallops with black pudding had I not had scallops the previous evening as part of a different tasting. With starters ranging for £6- £8 with the exception of a £12 sharing platter we thought these represented excellent value for such exquisite creations. With all the hard work of getting in to the lobster done Jem set about savouring the tender, juicy lobster meat. The prawns were cooked to perfection too and full of flavour. The Buttered New Potatoes were just cooked in the way Jemma loves. Fresh with a waxy firmness and thin skin you could tell they were a quality spud and were complemented well with the rich white wine sauce. A very nice main course indeed. For my main I'd opted for the Pheasant. It's something I haven't seen on a menu for some time. The choice of grill toppings didn't really lend themselves to the pheasant which already had a streaky bacon topping so I opted for two sides instead. Buttered Spinach (£3.50) and Triple-Cooked Chips (£3.50) alongside a Red Wine Gravy (£3.50) to compliment the pheasant. I was really happy with my choice of the pheasant breast. It came out sat on the buttered spinach cut in half showcasing the succulent meat. Upon cutting in you could tell this was a nicely cooked through breast. Well cooked the whole way through without being overdone. The bacon added a lovely saltiness to the meat and it's richness was intensified by the red wine gravy and the spinach. The Triple Cooked Chips were very much a Liam choice. Fluffy on the inside with a nice gentle exterior crunch. They worked great dipped into the red wine gravy which could have done with an extra reduction just as a sauce instead of the gravy to dip the chips. Maybe I could have gone a little more adventurous than chips however with the duck fat roasted new potatoes also sounded like a great choice. After sampling such delights for starter and main we really needed to find out just what the desserts were like. Jemma opted for the Cheese Board (£8) with her more savoury palate. The cheese board featured Applewood Smoked Cheddar with a beautiful smooth creaminess, some very gentle Barkham Blue with just a sour hint from the blue, a nice fruity, seasonal choice of Wensleydale with Cranberries and a nice, mature, punchy Lincolnshire Poacher. Served up with homemade crackers which resembled a crisped version of the buckwheat blini's from our starter alongside grapes, celery, soaked fruit and a sweet apple chutney/ There's a huge amount on that plate. The Cheese's were very well chosen and of great quality. Applewood is a regular choice for cheeseboards although the piece chosen seemed to ooze a creaminess not usually seen. We loved the addition of a sweet apple chutney although Jemma's personal preference would have been something more savoury to counteract the heavy soaked fruit which she struggled to finish. My choice was the Citrus Plate (£7). A creamy lemon ice cream served with a zesty lemon tart alongside a sharp lemon posset with candied lemon topping. I couldn't think of a better dessert for me. I adore the sweetness and sharpness of lemon so this dessert was as close top heaven as I'll get in a restaurant. We finished off with a small selection of truffles. White chocolate and a cocoa dusted dark chocolate truffle were a lovely way to finish a beautiful meal off in style. 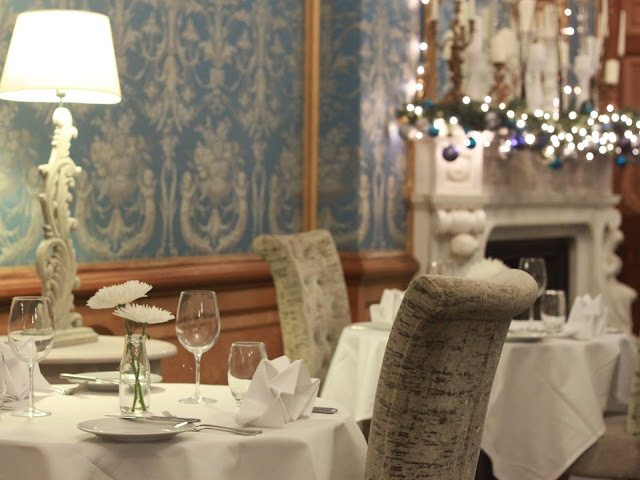 We had a wonderful experience at the Blue Grill at Thoresby Hall Hotel. It's a secret to us no longer with an amazing dining room that really will amaze you. From the wall coverings to the exquisite chandaliers there is a class about Thoresby that's rarely seen from our experience across the dining rooms of Nottingham. It just feels a level above.and whilst many places offer a fine dining experience the Blue Grill has set a new benchmark for us to judge others against in future. The Blue Grill is the kind of place I can see ourselves returning to again and again for special occasions. It's great to know somewhere that not a lot of non hotel residents are aware of although we're pretty sure that Thoresby Hall Hotel can really open up their facilities to locals to enjoy. We were welcomed into the hotel to help raise the profile of the Blue Grill and whilst we did not pay for our food the opinions stressed above are our own. We really found the Blue Grill to be an exceptional setting for a meal and hope you will do too.